These storms (lows) are outbreaks on the polar front or the generation or regeneration of a storm along the trailing edge of an old front. The low pressure along these fronts intensifies in certain areas as the front surges southward ahead of a moving mass of cold polar air. Much of the weather, especially the winter weather, in the Temperate Zone is a direct result of these storms. Air-mass weather also affects temperate climates. Air-mass weather is the name given to all weather other than the frontal weather in the temperate region. Air-mass weather is the net effect of local surface circulation, terrain, and the modifying effect of significant water bodies. There are many subdivisions of weather regions in the United States. 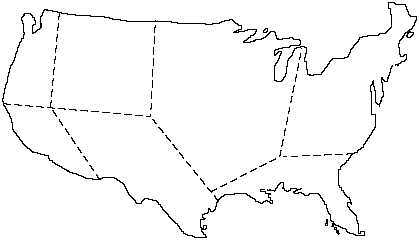 For the purpose of this discussion, we have divided the continental United States into seven regions as indicated in figure 6-9. Northwest Pacific Coast Area The northwest pacific coast area has more precipitation than any other region in North America. Its weather is primarily the result of frontal phenomena, consisting mainly of occlusions, which move in over the coast from the area of the Aleutian low and orographic lifting of moist, stable maritime air. Predominant cloud forms are stratus and fog, which are common in all seasons. Rainfall is most frequent in the winter and least frequent in the summer. Southwest Pacific Coast Area The southwest pacific coast area experiences a Mediterranean-type climate and is distinctively different from any other North American climate. This climate occurs exclusively in the Mediterranean and southern California in the Northern Hemisphere. In the Southern Hemisphere, it occurs over small areas of Chile, South Africa, and southern Australia. This climate is characterized by warm to hot summers, tempered by sea breezes, and by mild winters during which the temperatures seldom go below freezing. Little or no rainfall occurs in the summer and only light to moderate rain in the winter. Cold fronts rarely penetrate the southwest pacific coast region. The weather over this region is due to the circulation of moist pacific air from the west being forced up the slope of the coastal range. In the summer, air is stable, and stratus and fog result. In the winter, unstable air, which is forced over the mountain ranges causes showers or snow, showers in the mountains. Intermountain West Central Area The intermountain west central area includes the Great Plains region. This region is located east of the Cascade and coastal ranges, west of the Mississippi Valley, and north of the southwest desert area. The climate is generally cold and dry in the winter, and warm and dry in the summer. Most of the region is 6-26 WEST CENTRAL INTERMOUNTAIN CENTRAL PLAINS NORTH ATLANTIC COASTAL SOUTHEAST AND GULF STATES S. WEST DESERT AND MOUNTAIN S. WEST PACIFIC COAST N. WEST PACIFIC COAST AG5f 0609 Figure 6-9.United States weather regions.